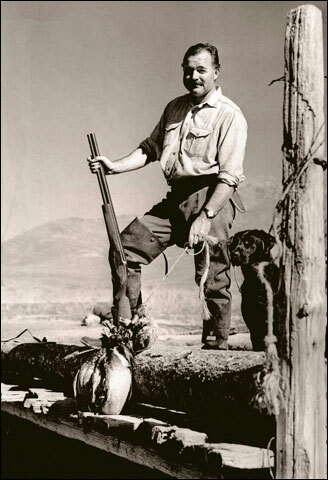 There were at least two Browning Superposeds in Ernest Hemingway’s life. One of them was a very early model that may have come indirectly from Val Browning, the son of John Browning, the genius who designed the gun. However, neither its serial number nor its fate are yet known. However, the second B25 − as the Superposed is still known in Europe − is a standard–grade 12-gauge field gun, Serial No. 19532, with double triggers and 28-inch barrels (both choked Full) with a ventilated rib. It was made in Belgium and sold to Master Mart, a retailer in Fremont, Nebraska, on 26 October 1949 for $195.20. After that, we don’t know how, when or where Ernest Hemingway acquired the gun, whether new or second-hand, or what he accomplished with it, but we know where it is today and how it got there. Hemingway knew and loved Paris, visited the city often, and frequently stayed − lived, in fact − at the Ritz, sometimes for many weeks. Hemingway’s legendary, if not mythic, “liberation” of Paris, on 25 August 1944, ended when he and his band of French and American irregulars sped down the Champs Élysées in their jeeps, turned left up to the grand old hotel, and Hemingway ran in to order martinis and lodging for everyone. Hemingway was in his 50s during Decobert’s early tenure at the Ritz, and increasingly aware that his best days were behind him. Hemingway “used to come into the bar regularly, mostly to be alone,” Decobert told the literary journal Frank in 1998. But “he never drank a lot in the bar and we never saw him drunk. Everyone thinks of him as a big and brash man, but with me he was always friendly, even tender.” Especially as he aged, Hemingway was at his best with people to whom he had nothing to prove, and the younger they were, the more comfortably and genuinely he could play his “Papa” role as a mentor. Before Hemingway checked out of the Ritz that time, Decobert said, he returned to the bar and handed over the gun − Browning No. 19532 − in a brown case. “This is for you,” Hemingway told him. “But, Claude, there are conditions. This is a symbol of the battles you’ll face in your life. Because as you grow older you’ll have to fight for your life. All the time. The short letter that Decobert received with the gun (signed “from his old friend and fellow hunter Ernest Hemingway, Fait à Paris, Lu et approuvé” − written in Paris, read and approved) is dated 9 December 1956. Two weeks earlier, when Hemingway had arrived from Madrid, the Ritz staff had presented to him two trunks full of his notebooks that had been stored at the hotel since the 1920s. Faithful to his old friend’s instructions, Claude Decobert has never sold or given away the Browning. When, with the help of another Ritz barman − Alain Duquesnes, who in turn had been mentored by Claude − we tracked him down, in 2015, M. Decobert was genial and helpful. Through his daughter Anne he sent us photographs of No. 19532. The gun continues to be a symbol for him of necessary struggles, of the sort of determination that allowed Santiago to capture the giant marlin in The Old Man and the Sea, which earned Hemingway a Pulitzer Prize in 1953 and contributed to his Nobel Prize for Literature a year later. It’s likely that Hemingway was working on the book at the Ritz while his friendship with Claude was forming. Decobert ended his Frank interview with Hemingway’s suicide: “When he died in 1961, I wasn’t at all surprised. I knew why he ended up the way he did, by removing himself from life. Join an elite group of readers who receive their FREE e-letter every week from Shotgun Life. These readers gain a competitive advantage from the valuable advice delivered directly to their inbox. You'll discover ways to improve your shooting, learn about the best new products and how to easily maintain your shotgun so it's always reliable. If you strive to be a better shooter, then our FREE e-letters are for you. Shotgun Life is the first online magazine devoted to the great people who participate in the shotgun sports. Our goal is to provide you with the best coverage in wing and clays shooting. That includes places to shoot, ways to improve your shooting and the latest new products. Everything you need to know about the shotgun sports is a mouse-click away.